I've been lucky enough to travel to India this week to see the launch of AlSat Nano, our joint CubeSat mission with Algeria. The nanosatellite is the product of two years of close cooperation between Surrey Space Centre (University of Surrey) and the Algerian Space Agency (ASAL), as well as the UK based payload providers (led by Open University, Oxford Space Systems and Swansea University). 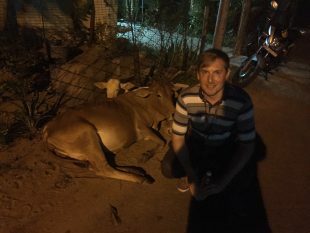 "quite alot of cows roaming freely - as is the case elsewhere in India, including on the motorway from Chennai city..."
We were invited to watch the launch from the Mission Control Centre. The building's architecture is pretty space age, and together with its near tropical setting, did have a touch of Tracy Island about it. The control room is set in front of theatre style rows of seats for guests to watch the pre-launch sequence run through, which it did flawlessly. Of course only the mission control staff have to stay inside for lift off; with a few minutes to go the rest of us rushed out to watch from the viewing balcony. length of the vehicle (which itself is 44m long). The second thing that hits you, literally, is the noise. After about 40 seconds the rocket disappeared into the clouds, but then came the full sound of the first stage propulsion - delayed because of the distance we were from the launch pad. This was like a 15 second continuous thunder clap that roared through us. Back in the control room we watched the vehicle's progress on the tracking monitors. After 15 minutes it had already passed the equator and was headed towards the South Pole. After 17 minutes the primary payload, ISRO's ScatSat-1, had successfully separated. As ISRO's key launch objective this brought much celebration around the room, but I wouldn't be to relax for another 2 hours, nor would the teams providing the other 7 satellites on board; this was the time it would take for the PSLV to switch orbit and deploy its secondary payloads. 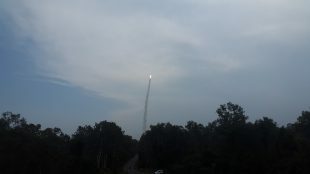 The PSLV carried out two further pole to pole orbits, reigniting its final stage propulsion twice, before beginning a rapid sequence of deployments; all 7 satellites were deployed within 3 minutes, with AlSat Nano first in line. The quick succession of rapturous applause for each separation was a great way to end a flawless launch campaign for ISRO and its PSLV team. As the first PSLV launch to inject payloads into two separate orbits, it was the most complex and longest duration mission they've carried so far, and the sixth ISRO launch in 2016 alone - a very impressive achievement. "the first thing that hits you is the sheer power of the propulsion"
A few hours after the event I headed to the launch pad to take a look around. The smell of residual propulsion was still in the air as I was able to walk right up to the flame trench, with the 50m high fuelling tower standing over me, its metal still creaking from the heat. Seeing all the intricate pipework and huge support infrastructure I got a sense of the true scale of what I had witnessed from the mission control centre, and what an engineering feat it is to take on gravity and get into orbit. Heading back to the residential area (and spotting a few monkeys along the way), emails started coming through from the SSC and ASAL team to say that initial signs from the satellite were very promising. We're hoping that now in orbit the spacecraft will provide all of the mission partners with real life operations experience and a rich set of data from which to carry out research and validate new technology. You can find out more about AlSat Nano here, and we'll be providing regular updates on social media as the mission develops. Well done Ryan! To infinity and beyond!